Sozos wrapped up his postdoc (2016-2018) in the Kolbe lab at URI in May 2018. His research focuses on the application of population genetics to conservation questions. Check out his paper on the green anole invasion of Pacific Islands published in Diversity and Distributions. Sozos received his D.Phil from the University of Oxford working with Dr. Tobias Uller. His thesis research explored the phylogeography and genetics of colonization in wall lizards (Podarcis muralis), establishing the origin and reconstructing the introduction pathways of non-native populations in England. Sozos is exploring invasion genetics and eco-evolutionary dynamics in Anolis lizards. Zac graduated with his Ph.D. from the Ecology and Ecosystem Sciences program at URI after defending his dissertation entitled "Impacts of Urbanization and Invasive Species on Foraging Behavior and Body Size in Anolis sagei." Check out his first chapter published in Urban Ecosystems. After receiving his B.S. 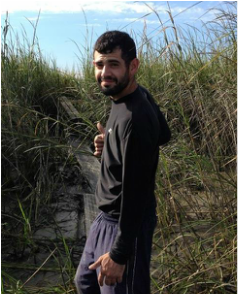 (’10) in Zoology from the University of Florida, Zac spent almost 2 years working in Georgia salt marshes studying trophic interactions. His interest in reptiles and amphibians was sparked during his M.A. 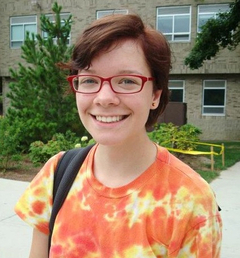 (’12) in Applied Ecology at Stony Brook University. There, his project used phylogenetic methods to examine the relationship between climatic niche width and species richness in Hylid frogs. Zac is applying his experience in field ecology and evolutionary biology towards questions regarding invasive species, interspecific interactions, and trophic ecology for his dissertation. Tia graduated in May 2018 with a major in Wildlife and Conservation Biology from URI. In summer and fall 2017, she worked with Ph.D. student Zac Chejanovski on a common garden breeding study looking a phenotypic differences between forest and urban populations of brown anoles. After graduation, she moved to Hawaii to pursue a career in environmental education with possible future plans including the Peace Corps and law school. Andrew defended his dissertation entitled "The Effects of Urbanization on Performance, Habitat Selection, and Persistence of Anolis Lizards" in April 2018, and graduated with his Ph.D. from the Ecology and Ecosystem Sciences program at URI. The first paper from his dissertation was recently published in Urban Ecosystems. Andrew graduated from Trinity University in San Antonio, Texas, with a B.S. ('12) in Biology and Urban Studies. He studied the impacts of urban land use on Anolis carolinensis in Dr. Michele Johnson's lab, and pursued interests in Urban Studies. 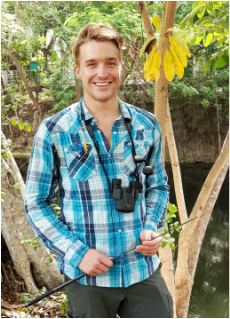 Andrew has done extensive field work in Miami studying the ecological and evolutionary impacts of urbanization on Anolis lizards for his dissertation research. In 2016-17, as part of his NSF Graduate Research Fellowship, Andrew will be in Washington, D.C. pursuing an internship opportunity at the US Geological Survey. 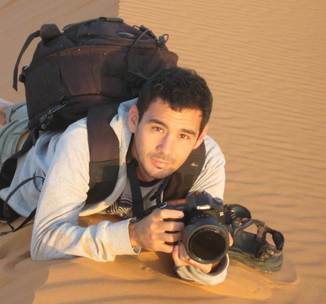 Marcos is an undergraduate at the University of Puerto Rico-Cayey majoring in Natural Sciences (B.S. expected June 2018). In summer 2017, he was a Science and Engineering Fellow in our lab. Marcos worked on a green anole sequencing project to determine the extent of the Anolis porcatus introduction in South Florida. 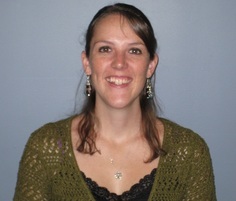 Hanna successfully defended her dissertation in August 2017. Congratulations! Her dissertation research in the Integrative and Evolutionary Biology Program at URI focused on population genetics and hybridization in Anolis lizards. She became interested in Anolis lizards as a study system during her M.S. in Evolution, Ecology and Systematics at Ludwig Maximilians University of Munich (Germany) and joined the Losos Lab at Harvard University to study evolution of morphological traits for her thesis project. 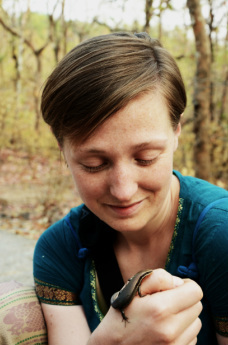 Hanna is broadly interested in evolutionary patterns and processes in amphibians and reptiles. 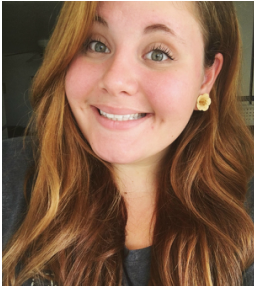 Jess graduated in May 2017 with a major in Wildlife and Conservation Biology at URI. 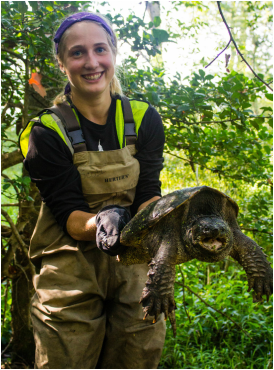 She worked in the molecular lab genotyping and sequencing for a landscape genetics study of painted turtles in Rhode Island with Ph.D. student Scott Buchanan (Dr. Nancy Karraker's lab) and worked on green anole hybridization with Ph.D. student Hanna Wegener. After graduation she worked as an exotic plant team intern for the National Park Service at Prince William Forest Park through the Student Conservation Association. Future plans include the Peace Corps and graduate school. Mariela finished her first year studying Environmental Science at the University of Puerto Rico, Rio Piedras (B.S. expected in 2019). In Summer 2016, she participated in the University of Rhode Island's Science and Engineering Fellows program. Mariela studied morphological variation among Anolis species and populations, spending many hours measuring traits from x-rays of anoles. 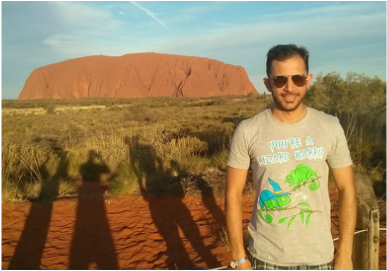 Oriol is now a Postdoctoral fellow in the Losos Lab at Harvard University. He is an evolutionary and behavioral ecologist interested in understanding the mechanisms that allow organisms to deal with changes in their environment. Oriol received his Ph.D. from the Centre for Ecological Research and Forestry Applications, Autonomous University of Barcelona, Spain, working with Dr. Daniel Sol. His research in our lab focused on foraging behavior in A. cristatellus (published in PLOS ONE) and the influence of biological invasion and urbanization on animal personalities using brown anoles in Miami (published in Global Change Biology). Elizabeth graduated in May 2016 from URI with a degree in Wildlife and Conservation Biology. She concentrated on two research projects in our lab. First, she helped identify arthropod prey items from stomach contents for a project comparing brown anole diets in urban and natural habitats with Ph.D. student Zac Chejanovski. Second, she measured kinematic variables from videos of anoles sprinting on natural and artificial surfaces with Ph.D. student Andrew Battles. Adam is an undergraduate at Brown University. He volunteered in the lab in the Fall 2015 semester assisting Ph.D. student Hanna Wegener with molecular data collection for her green anole hybridization project. 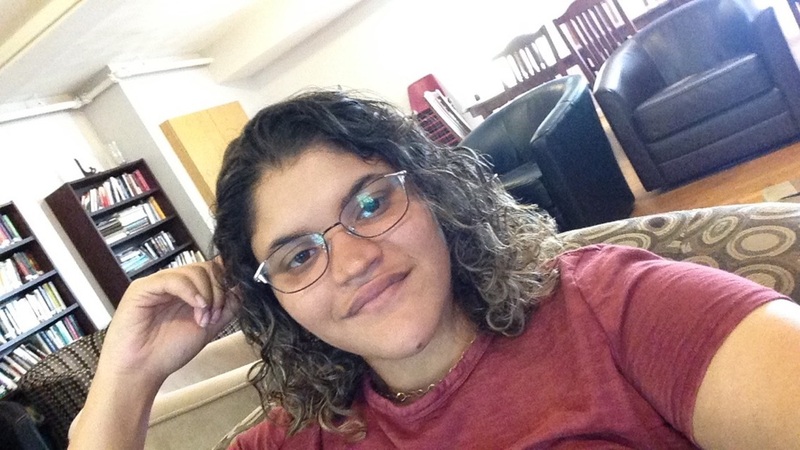 Jessica is an undergraduate studying Integrative Biology at the University of Puerto Rico, Rio Piedras (B.S. expected in 2017). She participated in the Science and Engineering Fellows program at the University of Rhode Island in Summer 2015. Jessica worked with Ph.D. student Hanna Wegener collecting genetic data to test for hybridization between the native green anole (Anolis carolinensis) and the invasive Cuban green anole (Anolis porcatus) in the Miami area. Kevin finished his M.S. in Ecology and Ecosystem Sciences at URI in May 2015. His thesis research investigated foraging and escape behavior of Anolis cristatellus in natural and urban habitats in San Juan, Puerto Rico and Miami, Florida. In Fall 2015 Kevin started his Ph.D. working with Dr. Liam Revell at the University of Massachusetts Boston. 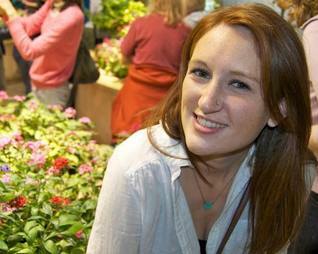 Haley graduated in May 2014 with a double major in Biological Sciences and Wildlife and Conservation Biology at URI. She did Coastal Fellow summer projects in 2012 and 2013 looking at genetic diversity and differentiation among non-native populations of Anolis cristatellus introduced to Miami and conducting a field experiment in Miami to understand the effects of artificial night lighting on lizard behavior and performance. As our lab technician in 2014-15 she took care of the lizards and generally held down the fort. Jhoset completed M.S. degree in the Ecology and Ecosystem Sciences program at URI in May 2014. 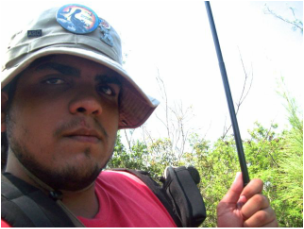 His thesis research investigated the effects of invasive Green Iguanas on seed germination and dispersal in Puerto Rican mangrove forests, which was published in Biological Invasions. He is currently in law school at the University of Puerto, Rio Piedras. 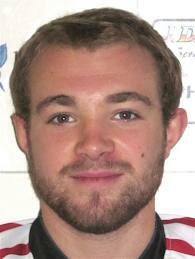 Danny is a graduate of Narragansett High School. 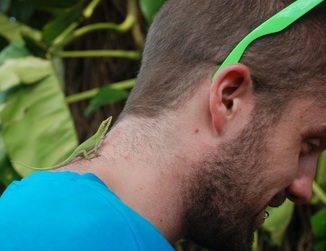 He helped with lizard care in Fall 2012 and helped with a project looking at the relationship between morphology and clinging performance in Anolis sagrei. Paul received his degree in Organismic and Evolutionary Biology major from Harvard University in 2013. 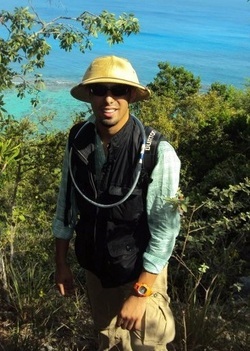 In the summer of 2012, he did his senior thesis in our lab conducting a common garden experiment to look at the genetic basis of morphological differences between introduced Anolis cristatellus populations in Miami and their sources in Puerto Rico. His undergraduate research contributed to multiple publications (Ecology & Evolution and Landscape Ecology) and he is currently at Harvard Law School. Angélica worked in the Losos Lab at Harvard University and our lab at URI as part of the Erasmus Mundus Masters program in Evolutionary Biology. She looked at morphological variation in a female back pattern polymorphism in Anolis sagrei. Max visited our lab during the 2012-13 academic year on a placement from the University of Manchester (UK) where he is working on a B.Sc. program in Cognitive Neuroscience with Psychology. He is interested in animal behavior, particularly predator-prey interactions. He did a field-based experiment on foraging with Anolis lizards, which was published in PLOS ONE. ​Kevin spent the Fall 2011 and early Spring 2012 semesters working in the Losos Lab at Harvard University and our lab at URI as part of the Erasmus Mundus Masters program in Evolutionary Biology (M.Sc. '12). He looked at morphological variation among island populations of brown anoles (Anolis sagrei) near Staniel Cay in the Exumas, Bahamas. Here he is doing his best impression of a trunk for an Anolis porcatus in Cuba. 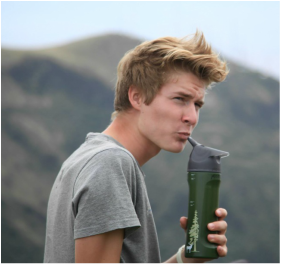 Ethan is an Environmental Science and Management major ('15) at URI. He helped out with lizard care and data collection in Summer and Fall 2012. We're happy he put off solving Rhode Island's environmental problems last summer to help take care of lizards. He recently discovered his love of soils and is doing research in Jose Amador's lab. Lacie was our molecular lab technician. She helped get the lab off to a great start, but moved on to the greener pastures of the biotech world (and a permanent position). She has a M.S. ('12) in Natural Resources from the University of Wisconsin-Stevens Point, for her thesis she looked at population structure in rock bass and johnny darters throughout Wisconsin. In addition to keeping the lab running smoothly, she's a whiz with STRUCTURE! Carly is a URI Marine Biology (B.S. '13) graduate. She assisted with general lizard care and data collection in Summer 2012.